I had driven through Humboldt and Dakota City a few times, stopping by Rustix only to find it closed on Mondays or in the middle of the afternoon. All I could do was look through the windows and wonder what was inside. 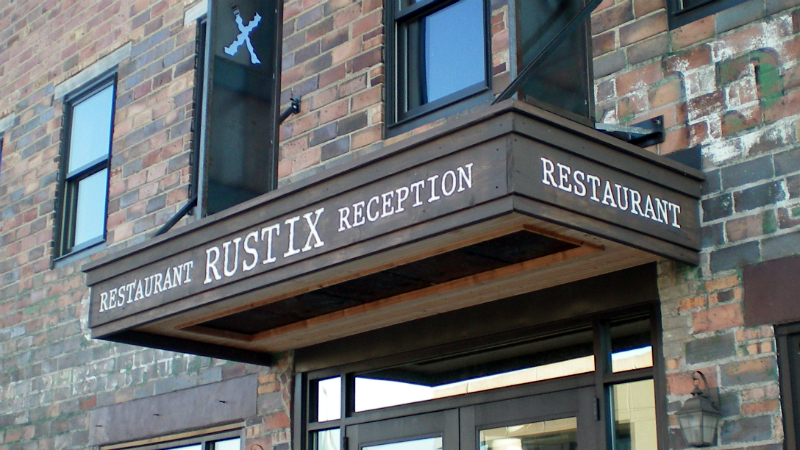 Rustix had been on my list of places to check out since it was named in the IPPA Best Tenderloin contest a few years ago. Location: 716 Sumner Avenue in Humboldt, a little bit north of Fort Dodge in North Central Iowa. Directions: Main St. in Humboldt requires turning off the State Highway and following some signs to reach the business district. The Tenderloin: Well this was a long one, the thin pork loin had been pounded out from the center so it was shaped like the longest loin I've had. The cracker shattering sensation is present in every part of this sandwich. The meat was pounded out thin, butterfly cut a couple times, and the edges stood out proudly firm from the edge of the plate. Served with lettuce and pickle with a soft french bread type bun. Overall 8.9 out of ten. Price: $8.00 with a side for lunch. Also on the menu: The menu is big with chops, steaks, sandwiches, and salads. I ordered my tenderloin with Sweet Potato Fries, and some spicy mustard came on the side. I wasn't sure if the mustard was for the tenderloin or the fries. Service: I came by during the off hours and ate at the bar, but there is a hostess table and waiting area for table service and spaces for hosting private receptions. Ambiance: If you look closely at the exterior pic you see a ghost sign of the old John Deere dealership that used to occupy this building. This is a historic Main St. brick building remodeled into an upscale restaurant with exposed brick, high ceilings, matching woodwork and modern fixtures. Final Thoughts: I was glad Rustix was open when I drove through. The region around Ft. Dodge can be intimidating to visitors, there are so few places worth checking out nearby. Seriously, what is a place this nice doing in this area? The family owned Maid Rite franchises are usually identified by a proper name in the title, an old location in the middle of a town, older or ancient fixtures inside, and conspicuous additions to the menu or the interior. Marion Maid Rite has all of those things, and its only been around since the Eighties. Location: 1000 7th Ave, in Marion, just outside Cedar Rapids in Eastern Iowa. Directions: I think this is the old section of Marion, you get here by taking 1st Ave. NE from dowtown Cedar Rapids. Online at: website with menu is HERE. 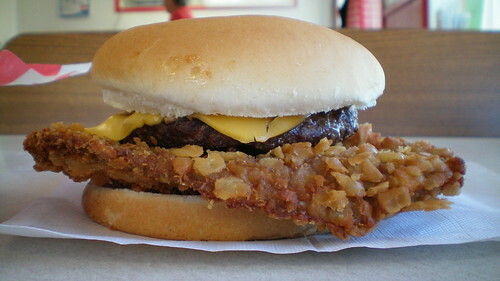 The Tenderloin: The bright white meat was just a little soft, with just a little juice. The one standout thing was the good cracker-like crunch. The breading had little seasoning but a nice golden brown color. Served on an untoasted sesame seed bun, overall 7.0 out of ten. Also on the menu: The menu proudly state Hand Breaded Iowa Tenderloins, and goes on to claim "The Best Maid Rites in Years". That claim makes me wonder if there were some legendary loosemeat sandwiches served nearby a long time ago for local reference. In addition to the usual sandwiches, Marion Maid Rite has homemade pies, soups, and salads. Service: There is a counter for seating and another for takeout orders, I think they do table service but I didn't stick around. Ambiance: You realize is not a corporate Maid Rite when you walk in and see a display of decorative sticks and tie-dye shirts just past the door. There is an old counter area and booths for seating, it looks like they expanded into the space next door at some point for additional seating. Final Thoughts: I would love to hear about any more old Maid Rites serving homemade tenderloins, I have heard Oskaloosa Maid Rite Diner advertises one. My next stop in Cedar Rapids area might be down 1st Ave at the old Riley's location near Coe College. They have a gravy smothered tenderloin and a horseshoe style breakfast loin on their menu I have to check out someday.